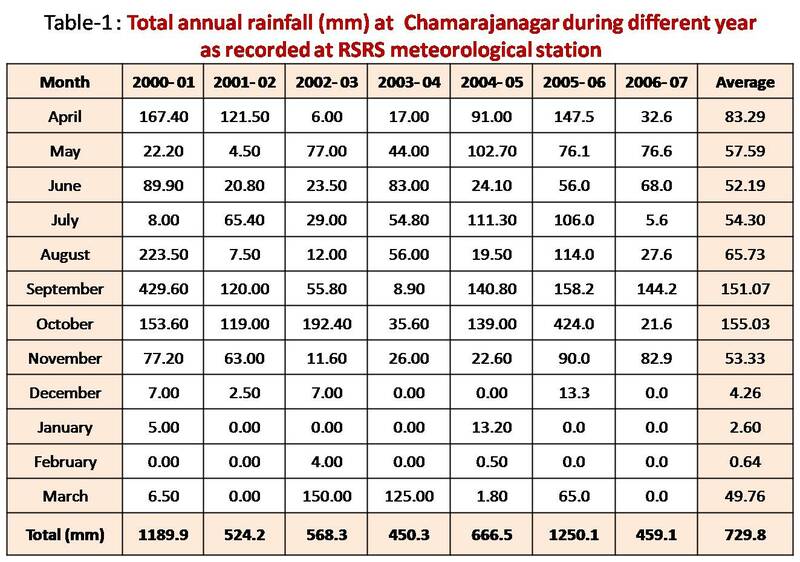 The first & third authors have retired as Scientist-D in November & September 2010 respectively from Regional Sericultural Research Station, Chamarajanagar (Karnataka) of Central Silk Board, Ministry of Textiles, Govt. Of India. Intercropping can be defined as agricultural practice of cultivating or growing of two or more crops simultaneously on the same area of land for increasing the returns from unit area of land. The crops are not necessarily sown at exactly the same time and their harvest times may be quite different, but they are usually “simultaneous” for a significant part of their growing periods. It is a practice often associated with sustainable agriculture and organic farming. Intercropping is one form of polyculture, using companion planting principles. Intercropping may benefit crop yield or the control of some kind of pest, or may have other agronomic benefits. In intercropping, there is often one main crop and one or more added crops, with the main crop being the one of primary importance because of economic or food production reasons. The two or more crops used in an intercrop may be from different species and different plant families, or they may simply be different varieties or cultivars of the same crop species. Intercropping offers farmers the opportunity to engage nature's principle of diversity on their farms. Spatial arrangements of plants planting rates and maturity dates must be considered when planning intercrops. Intercrops can be more productive than growing pure stands. The most common objective of intercropping is to produce a greater yield on a given piece of land by making use of resources that would otherwise not be utilized by a single crop and thereby to augment the income. Careful planning is required, taking into account the soil, climate, crops, and varieties. It is particularly important not to have crops competing with each other for physical space, nutrients, water, or sunlight. Intercropping of compatible plants also encourages biodiversity, by providing a habitat for a variety of insects and soil organisms that would not be present in a single crop environment. This biodiversity can in turn help to limit outbreaks of crop pests by increasing the diversity or abundance of natural enemies, such as spiders or parasitic wasps. Increasing the complexity of the crop environment through intercropping also limits the places where pests can find optimal foraging or reproductive conditions. 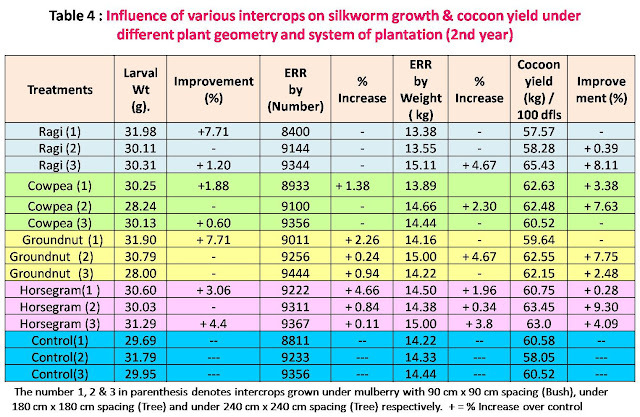 Intercropping has been tried in paired row system of mulberry under irrigated condition in Kharif with French bean (Phaseolus vulgaris) and Radish (Raphanus sativus) and with Sabssige (Anethum graveolens) , Methe (Trigonella foenum graecum) and Palak (Spinacea oleracea) in Rabi at CSRTI, Mysore. Intercropping was also done with Bengal gram, Gladiolus, Marigold, Amaranthus and Cluster bean to improve the net returns (Ravindran et.al , 2003, CSR&TI, Mysore). 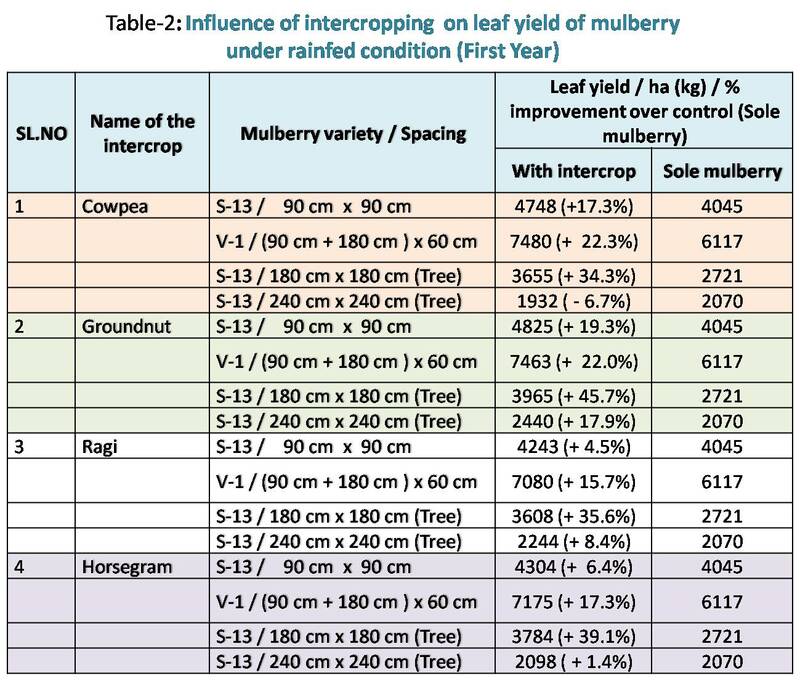 Intercropping in rainfed mulberry with different cereals, pulses, millets, oil seeds and vegetables was studied in ICAR adhoc research project on “Development of appropriate inter cropping system for rainfed mulberry garden” (Shankar and Devaiah, 2002 , UAS , Bangalore). The report revealed that there was no adverse effect in mulberry or on silkworm growth and production. Besides, it also increased the net income per unit area of mulberry garden. 1. Row intercropping: This involves growing two or more crops simultaneously where one or more crops are planted in rows. 2. Mixed intercropping: Here two or more crops are simultaneously grown intermingled in the same plot with no distinct row arrangement. 3. Strip intercropping: It involves growing two or more crops simultaneously in different strips wide enough to permit independent cultivation but narrow enough for the crop to interact agronomically. 4. Parallel multiple cropping: In contrast to multiple cropping in series, one could visualize the situation of parallel multiple cropping where two crops of dissimilar growth habit are made to grow simultaneously in such a way that they do not affect the performance of each other adversely. 5. Relay intercropping: Growing component crops in relay so that growth cycles overlap. 6. Multi tier intercropping: It is a system of growing together crops of different heights at the same time in the same piece of land and thus using land, water and space most efficiently and economically. 7. Alley cropping: Alley cropping is essentially an agro forestry system in which food crops are grown in alleys formed by hedge rows of trees or shrubs. The data clearly revealed that among all the intercrops, groundnut has influenced maximum on the leaf yield of both the S-13 and V-1 mulberry varieties. Among all the planting geometry, tree plantation under 180 cm x 180 cm spacing showed the promising result. A maximum percentage of improvement in the leaf yield (45.7 %) was observed in the first year from S-13 mulberry variety as tree plantation under 180 cm x 180 cm spacing with groundnut intercropping (Table-2). 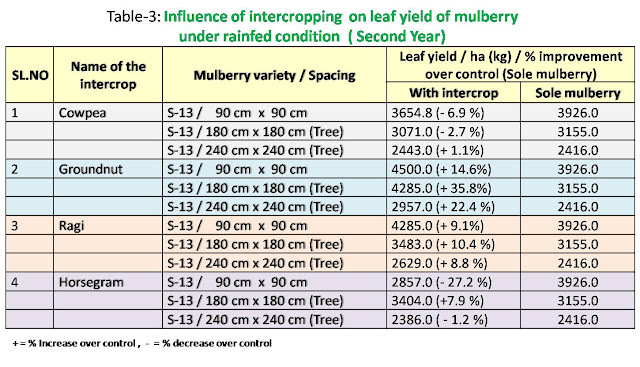 The second year data also clearly revealed that among all the intercrops, groundnut has influenced maximum (35.8%) on the leaf yield of S13 mulberry variety as tree plantation under 180 cm x 180 cm spacing (Table-3). 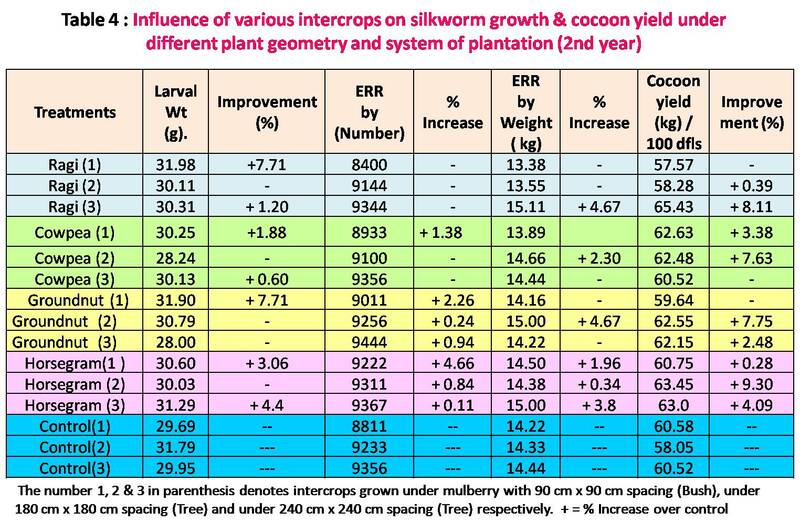 A silkworm rearing was conducted in 2nd year which did not show any significant variation in the larval growth, survivability and cocoon yield due to intercropping as compared to control (sole mulberry) suggesting no adverse effect of intercropping on mulberry leaf quality ( Table-4). A substantial yield of intercrops specially groundnut and cowpea was also recorded under both the S-13 and V-1 mulberry varieties indicating a positive role of intercropping in augmenting income (Table -5). However, the intercropping in 3rd year failed due to poor rainfall. The cost benefit ratio was worked out for intercropping under mulberry. The intercropping with cowpea and groundnut was found to be quite profitable while horse gram and ragi intercropping was found not profitable under rainfed mulberry. v Hence, intercropping once in a year in S-13 mulberry during rainy season with cow pea and specially with groundnut under 3 ‘ x 3’ row system of plantation, V-1 mulberry with paired row system as well as S-13 mulberry under tree plantation with 6’ x 6’ or 8’x 8’ is recommended. v This will augment the farm income besides proper utilization of farm land. v While intercropping with cowpea the seed rate should be @ 20 kg / ha and groundnut @ 100 kg / ha following line / row sowing method keeping a distance of 1 feet from line to line / row to row. v Chemical fertilizers should be applied for the intercrops at the rate of 30:50:30 NPK kg / ha / year besides application of the recommended dose of fertilizers for mulberry during rainy season. FYM can be applied as per the recommendation of mulberry cultivation under rainfed condition. The intercropping in rainfed mulberry is under popularization among the sericulturists of Chamarajanagar. For which the DOS has been also involved for assisting in the farmers field. An Action plan has also been submitted to DOS. The study in interesting, informative and the data shows remarkable results. I would suggest the authors to choose the best intercrop, may be one or two and go for large scale demonstrations for getting more worthier results. This will help convincing the farmers and society.